The conditions created for athletes at the National Gymnastics Arena in Baku are beyond praise, Fukuo Makoto, coach of the Japanese gymnastics team, told Trend on March 14. He said the hall in the National Gymnastics Arena exceeded all expectations. 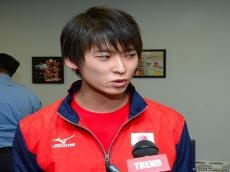 “Excellent conditions have been created here and our athletes are very satisfied,” said Fukuo Makoto. The Japanese coach added that his country will be represented by three athletes in the FIG Artistic Gymnastics Individual Apparatus World Cup due to changes in rules of artistic gymnastics. He noted that the Japanese athletes are counting on the highest results. “We want to show good performance, to neatly perform all the elements and win many medals of the highest value,” added Fukuo Makoto. The FIG Artistic Gymnastics Individual Apparatus World Cup will be held in Baku on March 16-19. Athletes from 23 countries are expected to perform at the World Cup to be hosted by the Azerbaijani capital for the second time. Qualifications will be held on the first two days of the event followed by the Apparatus Finals on last two days.